At Northern Basement Systems, it's our job to make sure that your musty crawlspace is transformed into a clean, dry, and energy-efficient space. For a free crawl space repair quote, call or e-mail us today! Northern Basement Systems provides free/ no cost estimates on affordable crawl space vapor barrier installation by certified trained crawl space repair contractors in Keene, Burlington, Colchester, Rutland, Laconia, South Burlington, Bennington, Brattleboro, St Albans, Montpelier, Lebanon, South Woodstock, Claremont, Concord, Milton, Berlin, Hanover and surrounding Vermont and New Hampshire areas. 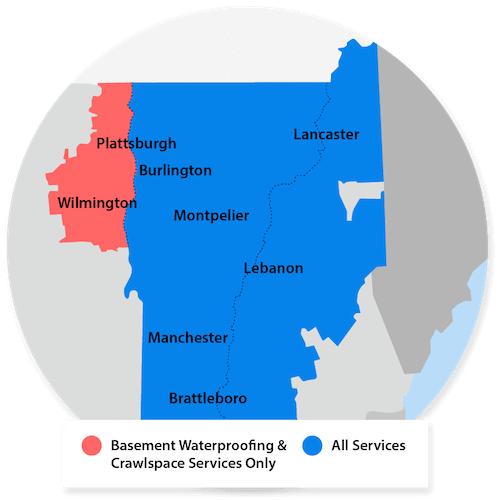 Our company's crews of crawl space contractors are professionally certified at the Basement Systems® International Headquarters in Seymour, CT.